Conferences are a great way to get away from the computer screen, share ideas, thoughts on research and catch up with other academics from related fields. The 2nd ‘Doing Women’s Film and Television History’ conference was organised by WFTHN members Melanie Williams and Yvonne Tasker (University of East Anglia) and Laraine Porter (De Montfort University). Given that women have been significantly contributing to film and television for over a hundred years, it is perhaps a little depressing that this is only the second year that the conference has been running but here’s hoping that its scope and status continues to develop into the future. I participated in a panel presentation alongside Dr Bridget Conor and PhD candidate Natalie Wreyford, both from Kings College, London. Bridget introduced the themes that all three of us alluded to in our work, that of the relationship between the structural conditions of the creative industries and the subjective experiences of those within its workforce, with particular interest in how women’s stories of working in a ‘creative’ context challenge assumptions and myths about what it is to be a creative or cultural producer. Bridget referred to her own research on screenwriters (click here for her full research profile and list of publications). My paper drew on my research on the experience of working mothers in creative work. The purpose of my research is to consider how the experience of work adopted by the creative industries covers up the subjective experience of certain groups who through other social demands cannot participate in a celebrated model that foregrounds work identity over any other social, cultural, biological factor. Natalie’s paper drew from her research on the continuing scarcity of female screenwriters in film. Her research approach applies critical discourse analysis to interviews with both screenwriters and employers in the UK film industry to question a notion of ‘acceptable inequalities’ and challenge reasons given for the continued scarcity of female screenwriters. Her paper highlighted a series of myths about female screenwriters, namely that women write in a certain way that limits their opportunity to be commissioned for bigger-budget action films and an assumption that ‘things are getting better’. Natalie’s paper put together data from US academic, Dr Martha Lauzen’s series of surveys of the top 250 grossing films in the US over the past 16 years which clearly demonstrated that there has not been a steady increase in the number of films written by women on a high-ranking scale and that the number has continuously fluctuated between 8-16%. What I found interesting is how the theme of ‘myths’ within film and television kept cropping up throughout the conference. As I attended different papers and talks, themes like ‘women don’t work because they have children’, ‘women write differently to men’, ‘women aren’t funny’, ‘films directed by women don’t make any money’ were mentioned again and again and – this is the depressing part – in each and every single case it was shown that we have got the research to prove that the myth is false. It seems that we now have a growing body of research to prove that women can be funny; and that women can work and raise healthy, well-balanced children at the same time. 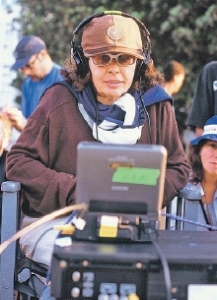 Films written or made by women are very successful; a women can write an action thriller. I’m not highlighting these terms as a way to prove that somehow women are better than men, more to point out that so many of the decisions made by those in power are based on myths that are fantasy despite clear evidence to the contrary. Perhaps more is needed to be done in terms of research in order to further break down how these myths prevail and think about more direct action that could be taken to ensure women’s participation in the film and television industry is not limited due to stereotypical assumptions. This is a shortened version of the review Tamsym has posted on her own blog http://tamsyndent.wordpress.com/. Having become aware of the existence of WFTHN only during the summer of 2013, I was keen to attend the conference and present some work at it, since I have been researching (mainly French) women film directors, alongside other areas, since 2007. The other presenters in my panel, ‘Women Auteurs, Identity and Counter-Narratives’, spoke about queer kinship in the films of Taiwanese Zero Chou and the reconstruction of memory in various films directed by Brazilian Lucia Murat, forming exactly the kind of international ‘take’ on women’s film-making I had hoped the conference would offer alongside the diverse work on British women in film and television I now know to be the core of WFTHN activity. In fact, both British-based and international sessions at the conference turned out to be of equal interest: it was inspiring to hear Beeban Kidron in conversation and to learn more about feminist film-making and collectives in Britain in the 1970s from those who were there (Barbara Evans in the London Women’s Film Group, Terry Wragg at the Leeds Animation Workshop), while the BFI archive screenings presented by Laraine Porter and Bryony Dixon supplied a more strictly historical dimension of British women’s roles on and off screen during the First World War. Lynne Parker (from the group Funny Women) had composed a talk that, as well as including some classic and hilarious clips of the likes of Gracie Fields and Joyce Grenfell, illustrated irrefutably that there are untapped reserves of female comic genius in British society. Although the keynotes given by Sue Thornham, Jackie Stacey, Christine Gledhill and Helen Wheatley focused particularly on British and Anglophone directors, performers and scriptwriters, the international dimension of women’s work in film returned in Jane Gaines’ keynote, a kind of supplement to her hugely important Women Film Pioneers project that asked some difficult but necessary and very precise questions about doing women’s film history, the theme of the conference. Plenaries and keynotes aside, I tended to opt for panels about non-anglophone cinemas, including a fascinating session on women’s film-making in Eastern Europe (Hungary, Poland, and the Czech and Slovak Republics) and absorbing papers on Iranian and Argentinian directors in the panel entitled Cine/Feminism. All in all, the conference hosted so much interesting work on women in film and television that I regretted not having known about the 2011 event and have pledged to return in 2016. WFTHN felt like a network taking off, and one that can go from strength to strength. Tamsyn Dent is a PhD student researching the gender gap in the UK creative industries and the impact of motherhood on women’s career pathways. The project is a collaboration between Bournemouth University’s Centre for Excellence in Media Practice (CEMP) and Creative Skillset. Tamsyn started her career in the film and TV industry, working as a freelancer for independent production companies and for the woman’s film festival Birds Eye View. She has an Masters in Gender and Media from the LSE. She is based in London, has two children and regularly speaks at events about her work on motherhood and creative work. Kate Ince teaches and researches film at the University of Birmingham. She has written and edited books on Georges Franju and contemporary European French-language cinema, guest-edited journal issues on ‘post-national’ cinema and French women’s film-making in the 2000s, and is now completing a co-authored critical edition of writings from the French filmology movement and writing a book entitled ‘The Body and the Screen: female subjectivities in contemporary women’s cinema’. This entry was posted in WFTHN Blog and tagged Barbara Evans, Beeban Kidron, BFI, Bridget Conor, Bryony Dixon, Doing Women's Film and Television History Conference 2014, feminist film-making, Funny Women, Gracie Fields, inequality, Jane Gaines, Joyce Grenfell, Kate Ince, Laraine Porter, Leeds Animation Workshop, London Women's Film Group, Lucia Murat, Lynne Parker, Martha Lauzen, Natalie Wreyford, Tamsyn Dent, Terry Wragg, women and the creative industries, women auteurs, Women Film Pioneers Project, women screenwriters, working mothers, Zero Chou by womensfilmandtelevisionhistory. Bookmark the permalink.